If you look at Triumph's Modern Classic lineup, there is no bike that can match the Thruxton in outright performance. It is one of the best lookers amongst their range (the Bonneville Bobber might fancy a few) but undoubtedly, it is the the only one which can give middleweight supersports a run for their money. It is, in my humble opinion, the best cafe racer that money can buy in the world. However, all this comes at the cost of practicality. The Thruxton isn't the most friendly motorcycle to live with and only if you are a nutter like me would you consider it a viable option for most road-focused scenarios. Thankfully, for all of you who aren't like me, Triumph has brought in a sensible, friendly and more importantly, accessible motorcycle derived from the Thruxton. Behold the Speed Twin. That's the whole point of making it more user friendly than the Thruxton. It has to look more approachable, more relaxed than the cafe racer, but not as much to fail to distinguish from the Bonneville T120. With its mean black butch demeanour, the Speed Twin does look like one badass naked roadster. The colour plays a key role in bringing about this feeling as the majority of the motorcycle's parts are blackened. Yet, items like the mudguards, throttle body covers, side panel finishers, heel plates and headers get this lovely brushed aluminium finish which look cool as hell. There are a couple of two-tone colour schemes of which the Korosi Red-Storm Grey scheme is our preferred option. It gets a hand-painted pinstriping separating the two colours along with a white stripe below the Triumph logo. Even though the styling is unmistakably Bonnie, it leans more towards the modern side in the Modern Classic oxymoron. Items like the round fuel tank, round headlamp, single bench seat and minimalistic mudguards are reminiscent of the classical roadster styling. However, the headlamp houses a LED DRL with a halogen bulb. The indicators as well as the tail-light are LEDs too. The concept of bar-end mirrors might be retro but they are the same ones found on the Triumph Street Triple RS. There are no spoke rims here; instead the Speed Twin gets 7-spoke cast aluminium alloys. These wheels aren't shod with Pirelli Phantom SportComp tyres like a Bonnie either, but get modern Diablo Rosso IIIs. It doesn't get the cool new colour TFT dash like the Scrambler 1200 but much rather a refreshed version of the Thruxton's twin pod info cluster. The speedometer and tachometer readout are, as you might have guessed it, analogue. The two small digital screens offer a plethora of data and there are enough tell tale lights to keep you thoroughly informed on the ride. In case your sole objective of buying a fast, classic motorcycle was to hit the circuits or the twisties on a regular basis, then the Thruxton is a worthy companion. However, for anything and everything else, it can be a big pain to ride around. The Speed Twin wants you to enjoy the dynamics but with added practicality in the mix. The posture is still sporty with a slight forward lean towards the flat, wide handlebars. The bars are derived from their litre-class naked, the Triumph Speed Triple. And in order to make it more accessible for riders for all heights, the seat height is just 807mm. Even though the pegs are still a bit rear-set, they have been pushed forward by 38mm and lowered by 4mm (compared to the Thruxton). Seat cushioning is plush yet firm with 10mm more foam thickness than the Thruxton. Even after riding for close to 270km, there were no complaints from my backside. That said, I would have prefered the front end of the seat not taper off as much as it does, as it did dig into my large thighs. And then, for the pillion, there is no grab-rail, but you do get a seat strap. At the heart of the Speed Twin is Triumph’s big 1200cc parallel-twin motor which is highly feature-laden despite its old-school look. It comes in the High Power state of tune, just like the Thruxton, and that means you have 97PS of power and 112Nm of torque. In fact, there’s so much grunt here that you get upwards of 100Nm coming in from as low as 2000rpm, going all the way up to 6250rpm where it tapers off gently. And on top of that, the engine is 2.5kg lighter than the one found on the Thruxton as this one gets new magnesium cam covers, a revised clutch assembly and mass optimised engine covers. Mated to a six-speeder with a torque assist clutch, the Speed Twin never feels gasping for breath. You can lug around in third at 30kmph. You can even pull cleanly away from speeds as low as 55kmph in sixth gear, all the way up to speeds in excess of 200kmph. And this is just in Road mode. Yes, the Speed Twin also gets the same electronic aids setup like the Thruxton. Ride-by-wire, three rider modes (Rain, Road and Sport), ABS and switchable traction control give you supreme control once you have saddled up. Intervention of safety aids such as traction control and ABS was apparent in almost all three modes. Unfortunately, we did not get a chance to really test out the Sport mode and shut the traction control off for some naughty action, as majority of the riding was done in the other two modes with TC active, as the roads were moist for the better part of the ride. But even if we weren’t able to hoon around, one aspect of the Speed Twin that was still really enjoyable was the exhaust note. The sporty upswept megaphone end-cans look awesome and produce a brilliant parallel-twin symphony. The bassy burble grows into a roar as you start opening the taps, which guarantees a eargasm. I have not addressed where Triumph got the name for this baby up until now and I have a good reason for that. In 1938, they had a motorcycle with the same name and that was said to be the first real ‘rider’s bike’ with class-leading performance and handling. In 2019, Triumph has aimed to replicate that feeling with this latest Speed Twin. And they have succeeded. Much like the 1938 bike, and its other family members, this one too get a tubular cradle frame. However, the cradle section here is made from aluminium, which makes it lighter. The rear sub-frame has been altered to suit the roadster ergos. But while the sharp steering geometry is great for a cafe racer, for a roadster you would want to dial the agility down by just a notch. That’s exactly what Triumph has done. The rake has been pushed out by 0.1 degree, in comparison with the Thruxton, to 22.8 degrees. The trail now stands at 93.5mm, 2.7mm more than the Thruxton. At 1430mm, the Speed Twin’s wheelbase is 15mm longer, though the swingarm remains the same length. All this translates into an extremely capable motorcycle that is well equipped to take on the twisties. Zipping through the B-roads in Mallorca, the Speed Twin was gobbling up the corners with much delight. You can just point it towards corner apexes, with the chassis more than capable of handling that extra oomph. And as you see the exit, roll on the gas and the surge of torque makes sure you are darting across for the next bend and the next one and the one after that and countless more that you will want to encounter. This capable chassis is met with equally capable components. The suspension units from KYB are unique for this motorcycle. The front fork is a cartridge type with no adjustability while the rear shock units allow you to alter the preload settings. They are tuned on the sportier side which brings a wide smile everytime you approach the bends. But while it did soak in the small bumps that we encountered in Mallorca quite well, they were just peanuts compared to what we encounter in India. Thus, I would reserve my judgement on the ride quality front until we ride the bike on our roads. Like previously mentioned, the Speed Twin gets Pirelli Diablo Rosso III rubber. Although they offer Rosso IIs as an option, the reason they chose to go with the former is because the Rosso IIIs have an edge when it comes to wet weather grip. We did get to test its wet weather prowess and were fairly satisfied of how just how quickly they come up to temperature and how much confidence they offer on damp tarmac. The bite from the Brembo four-piston axially mounted callipers is phenomenal. Before you hound me, they are no monoblocs that you find on the Thruxton R, but they are brilliant and should be better than the standard Thruxton’s Nissin twin-pot floating units. They chomp down on speed in an instant with no finicky heartbeat skipping moments. There is enough progression in the retardation with ample feedback at the lever. The rear Nissin twin-piston calliper is a familiar component that we have seen in a couple of Bonnies and do a decent job here as well. 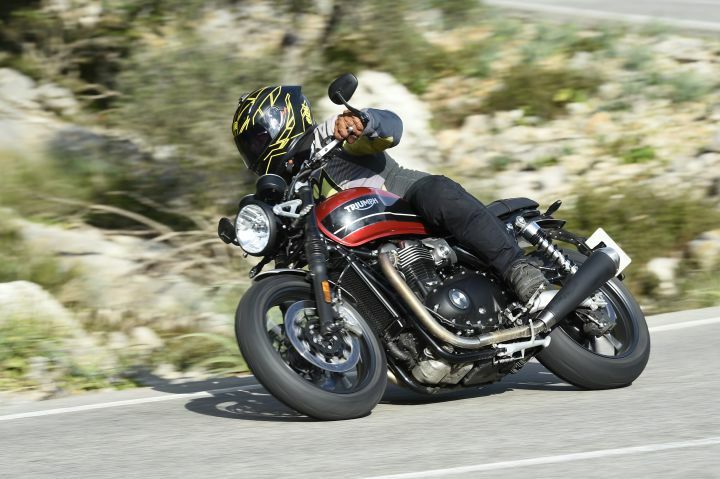 Triumph has hit the nail on the head by making the Speed Twin the most accessible big Bonnie that is also lively. I have to really nitpick to find faults, but even these faults are ones that you can live with. What does leave me longing for more is that in the same family, you get the Thruxton, which excites me more. Truth be told, I have been spoiled by the cafe racer. However, when it would come to putting down the money to buy either of the two, I would have a really difficult time. Especially considering that the Speed Twin will be competitively priced. In UK, the Speed Twin is cheaper than the Bonneville T120 but it is highly unlikely that this would be the case in India. Yet, it will bear just a slight premium over the T120, making it the second most affordable 1200cc Bonnie. And for nearly all of you who are enticed by the performance of the Thruxton, but would not want to compromise on everyday usability, the Speed Twin will delight you enough.